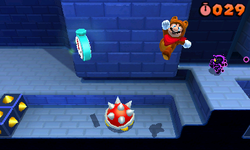 Special 8-1 is the first level of Special 8 in Super Mario 3D Land. It is based off of World 1-2. The player starts next to a bridge with several Spikes on it. After the bridge is an area with several Spinies and more Spikes in it. At the end of this section is a Warp Pipe that leads outside, where there are two ? Blocks, the one on the right containing a Super Star, and the Goal Pole. Star Medal 1: Floating above the Spiked Cylinder at the start of the level. Star Medal 2: Floating above the crumbling rock platforms. Star Medal 3: Floating next to the Warp Pipe that leads to the exit. The player needs to Wall Jump to get it. This page was last edited on April 9, 2019, at 00:24.